I am a sucker for a runny egg yolk. Not only do I love over-easy eggs for breakfast, but there aren't many savory main dishes that can't be improved by the inclusion of a runny egg. Salads, burgers, pizza... you name it. If a dish includes fried or poached egg on top, I'm most likely ordering it. There's just something so sensual about taking a perfectly cooked egg, poking it with your fork or knife, and watching that golden liquid ooze out onto your plate. It's the same kind of pleasure one gets from taking that first crack at the sugared crust of creme brulee. What kinds of things are you a sucker for on a restaurant menu? I wholeheartedly agree! I love the trend of a lightly poached or fried egg on top of literally everything in restaurants now! I'm never one to send food back in a restaurant, but the only time I was when my egg yolks were hard on an eggs florentine. Oh creme brulee is one of my biggest downfalls. No matter how satisfied I am with a meal, if someone mentions creme brulee, I have to to have some! Garlic bread, if it's on the menu no matter what I'm having for a main I always have it as an appetiser. 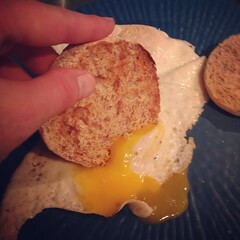 I semi-like runny eggs-only if I have great bread. I'm really bad about the fried appetizers. If there's a sampler platter, I want it! I love runny egg yolk. It's one of my favorite things in the world. I also have a terrible habit of ordering any type of alfredo if it happens to be on a menu. I'll go into a restaurant completely convinced that I'm going to order something new for a change, and then I'll see fettuccine alfredo and can't resist. Poached eggs are what I love but I can't order them very often. Seems restaurants don't want to poach for me. OK, that's fine.